The book (pictured below) was a going-away gift my husband gave me years ago–1994! And because technology is so advanced and the publishing industry has changed so drastically since then, most things written in this book are probably obsolete now. I keep it because it is a constant reminder to me that my husband believes in me! He is my biggest fan! He pushes me and believes in me and my writing when I’m discouraged and don’t even believe in myself. 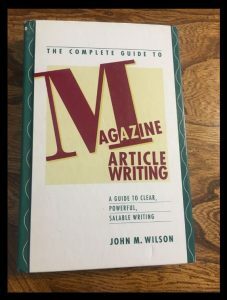 I hope that this going-away gift helps you to succeed in your endeavors to become a writer (and to make your first million bucks)! I sincerely hope that you make it into magazines and that God uses you as you so desire. He has given you wonderful insight into His Word, as well as a gift for using word pictures. I pray that your time in Dallas is very productive and that you’ll be able to attend your conference. I will miss you very much, but no matter what happens, I know that our friendship will never end. I love you very much and I wish you the best of luck! • I was leaving my relationship with Giff that had really just started. • I didn’t have a job. • I didn’t have permanent housing. • I only knew a handful of people, and even then they were acquaintances. Once I got settled in a temporary place to live with friends of a friend, I applied for a few jobs. I landed an interview in the editorial department at CFN magazine, and I jumped through all the hoops only to have the managing editor tell me the position had already been filled. Devastated, I spent the weekend crying out to the Lord that if there was any way possible, I wanted that job!!! That was a Friday. By Monday morning the managing editor had called to ask if I was still interested in the position because the other girl she hired decided at the last minute not to take the job. Those four years at CFN were some of the best years of my life! I sat under some very knowledgeable people helping out wherever I could, and wherever they would let me, in the magazine publishing process. When I left, circulation for that CFN magazine was around 80,000. I did photo shoots. I published the monthly staff newsletter. I helped with layout and design. I ate it up! It was also during those years that I got up enough nerve to submit a devotional piece I had written to a much smaller magazine, and to my amazement, they wanted it! They had some edits they wanted me to make, but they wanted to publish it. I was paid $15 for that little devotional! After that, I was hooked! Knowing the words I wrote ministered to someone was thrilling! I’m nowhere near being a prolific author, and I don’t have people knocking down my door asking me to come speak at some event. Most days, I know God has called me to write! Other days, my husband encourages me because he still believes in me even when I don’t believe in myself. Express a portion of God’s character that He has deposited inside of me — a portion that might not be shared if I don’t share it. We are all uniquely gifted in that way. That is why “She Speaks Conference” is so important to me! I have already become a member of Compel Training — a membership site for writers who want to write words that move people. She Speaks Conference is a place for me to refresh my learning in the publishing industry, network with other women who share the same calling, and possibly to pitch my book idea to a publisher. Writing a book proposal could happen this year, but I’m not quite sure I’m ready. But I am taking another step in leaning into my call as a communicator of God’s truth, whether that be through my blog (www.stuffofheaven.com), writing the book God has put inside of me or simply writing in my personal journal. I want to walk in the path I feel He’s carved out for me. We simply cannot afford to send me to this conference right now. Registration for this conference is $675. Airfare and Hotel will be around $900. Would you consider donating to help further me along in that path? Take a look at my Go Fund Me Campaign. All I can do is ask, and leave the rest up to God. It says in James, “You have not, because you ask not!” I have asked God, and now I am asking you. Thank you for considering it! If you are interested in helping get me to She Speaks Conference 2017, please visit my Go Fund Me Page here!